October 23, 1956 was a sunny day with a relatively warm, high temperature in the low 20s Celsius (70°F), which was uncommon that late in October. One can only wonder how differently things would have turned out if the weather had instead been cold and rainy. Fortunately, however, that was not the case. After finalizing their 16 Points the previous evening, the students in Budapest assembled in the early afternoon. The marches in solidarity with the events occurring in Poland left from the Budapest University of Technology and Economics and Eötvös Loránd University, and eventually met at József Bem Square, named after the Polish general who fought alongside the Hungarians during the 1848-1849 Revolution and Failed War of Independence. By this time the crowd numbers in the tens of thousands. The flag with a hole in the center, sometimes called the revolutionary tricolor and the symbol of the revolution, made its first verifiable appearance here. From here the crowd marched to parliament, demanding that reform communist and former Prime Minister Imre Nagy, perhaps the only communist in the country with any genuine popularity, address them. By the time the crowd assembled at parliament, the number had swollen to approximately 200,000. 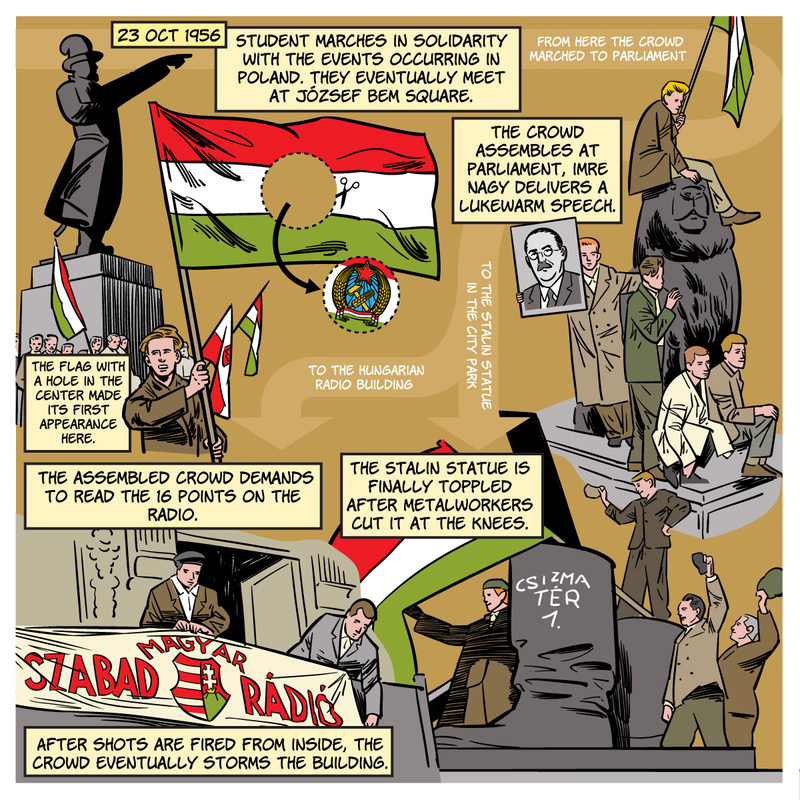 Nagy, after opening his speech with the poorly received greeting of “Dear Comrades!” delivered a lukewarm speech, after which some of the crowd departed for the Hungarian Radio building while others left for the Stalin statue in the City Park. The Stalin Statue, one of the most hated symbols of oppression in the country, was finally toppled after metalworkers cut it at the knees. The statue was then dragged around the city in continuously smaller parts. At the Hungarian Radio building in central Budapest, the assembled crowd demanded to read the 16 Points on the radio. Communist Party chief Ernő Gerő had by this time denounced the protesters over the air and called them fascists. To this day it remains a topic of debate of whether Gerő was deliberately adding fuel to the fire or simply that foolish, although most feel Gerő was trying to provoke a reaction from the crowd to justify a harsh response. After shots were fired around 9 PM (the first shots were almost certainly fired by ÁVH secret police from inside the building) an armed struggle ensued, with the crowd eventually capturing the building the following morning. With this gunfire the protests transformed into a revolution.